US PRESIDENT DONALD Trump at a Kansas rally celebrated the confirmation of Brett Kavanaugh to the Supreme Court, condemning Democrats for what he called a “shameless campaign of political and personal destruction” against his nominee. To cheers of supporters at the Kansas Expocentre in Topeka, Trump declared it a “historic night”, not long after signing the paperwork to make Kavanaugh’s status official. “I stand before you today on the heels of a tremendous victory for our nation,” he said to roars, thanking Republican senators for refusing to back down “in the face of the Democrats’ shameless campaign of political and personal destruction”. 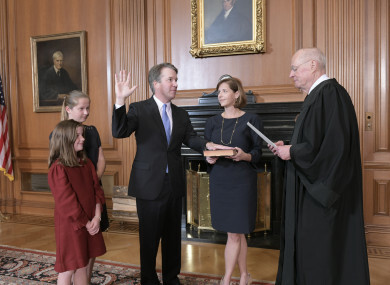 Kavanaugh was sworn in as a justice yesterday evening in Washington after an extraordinarily fraught nomination that sparked angry protests, nail-biting votes and a national reckoning about sexual assault allegations and who should be believed. Kavanaugh staunchly denied the allegations, but nearly all Senate Democrats voted against his confirmation. The final vote took place yesterday afternoon as the president was flying to Kansas aboard Air Force One, and he invited travelling reporters to his private office to watch the climactic roll call, which was interrupted several times by protesters in the Senate galleries before Capitol Police removed them. Very happy about it. Great decision. I very much appreciate those 50 great votes and I think he’s going to go down as a totally brilliant Supreme Court Justice for many years. Trump, throughout the day, insisted Kavanagh would not be tainted by the sexual assault allegations from Christine Blasey Ford and others that nearly tanked his nomination. Trump said he was “100%” certain Kavanaugh was innocent. “I have no doubt,” Trump said, telling reporters that he had chosen Kavanaugh, in part, because “there’s nobody with a squeaky-clean past like Brett Kavanaugh”. He said the FBI had done seven background investigations and argued that, had there been an issue, it would have surfaced sooner. If there was even a scintilla of something wrong — he was a very big judge for many years on what they call the second highest court — that would have come out loud and clear. Throughout the day, Trump also kept his focus on the opposition, saying Kavanaugh had withstood a “horrible, horrible attack” that “nobody should have to go through”. He continued lashing out at Democrats when he rallied supporters in Topeka, telling them “radical Democrats” have become “an angry, left-wing mob” and “too dangerous and too extreme to govern”. He urged Kansas voters to send Republicans to Congress. Kavanaugh’s nomination sparked protest across the Capitol, which continued yesterday. When the vote was over, hundreds of protesters massed on the Supreme Court steps, chanting, “We believe survivors”. Asked by reporters aboard Air Force One what message he had for women across the country who feel the nomination sends a message that their allegations of sexual assault aren’t believed, Trump disagreed with the premise, saying women “were outraged at what happened to Brett Kavanaugh” and “were in many ways stronger than the men in his favour”. “The crowd in front of the US Supreme Court is tiny, looks like about 200 people (& most are onlookers) – that wouldn’t even fill the first couple of rows of our Kansas Rally, or any of our Rallies for that matter!” he tweeted. Trump also revealed that he believed a widely criticised rally speech in which he mocked Ford’s Senate testimony had been a turning point for the nomination, changing the momentum in his favor. “I think that the Mississippi speech had great impact,” he said, calling it “a very important thing”. He later told Fox News host Jeanine Pirro in an interview from his limousine that once he made the comments, “it started to sail through”. He said yesterday he thinks Republicans “are going to do incredibly well” in the elections after Kavanaugh’s confirmation. Email “'Very, very good': Trump welcomes Kavanaugh's appointment to Supreme Court”. Feedback on “'Very, very good': Trump welcomes Kavanaugh's appointment to Supreme Court”.